Ship lap is easy to install and can be used in multiple applications, it can be painted, sealed, stained or left as is. 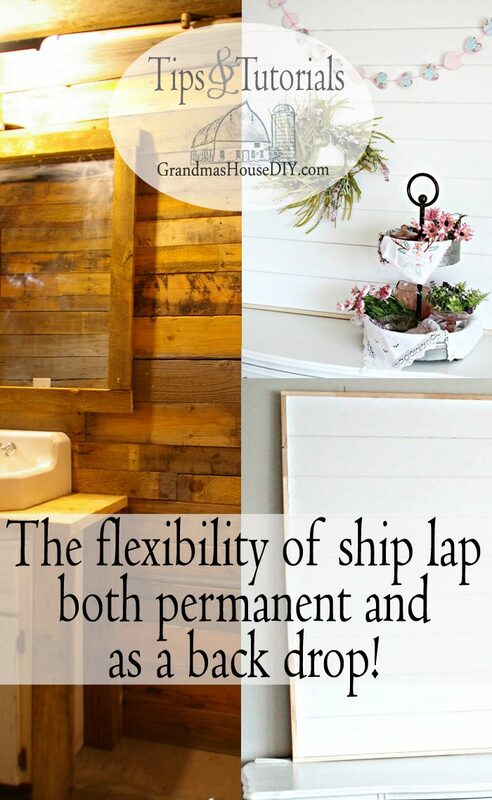 In my farmyard I’ve run into a lot of old ship lap that I’ve used extensively throughout my home mostly in permanent situations but it doesn’t always have to be permanent. What’s great is how flexible it is depending on your choice of finish and application but it still always adds that certain bit of country charm! Lets all give a big welcome to Leanna from Faeries and Fauna who will be joining me today to talk about how she used ship lap as a backdrop! My main experience using ship lap was in my basement. (Unfortunately it was not ALL ship lap as there was only so much leftover in my “barn stash” so I ended up with a combination of pallet wood, ship lap and barn wood all mixed in.) I liked the rustic look as my basement is “what it is” however there was a part of me that was really itching to paint it white 😉 In true Chip and JoJo fashion lol I still may end up going down there someday and painting it out (at least just in the bathroom) just to make the whole place a little cleaner and lighter feeling. Leanna: “Unfortunately, our home is very suburban, with a tiny yard. The only farm animals I have here come in motifs. I have commented before that I avoid doing anything permanently trendy to our home. 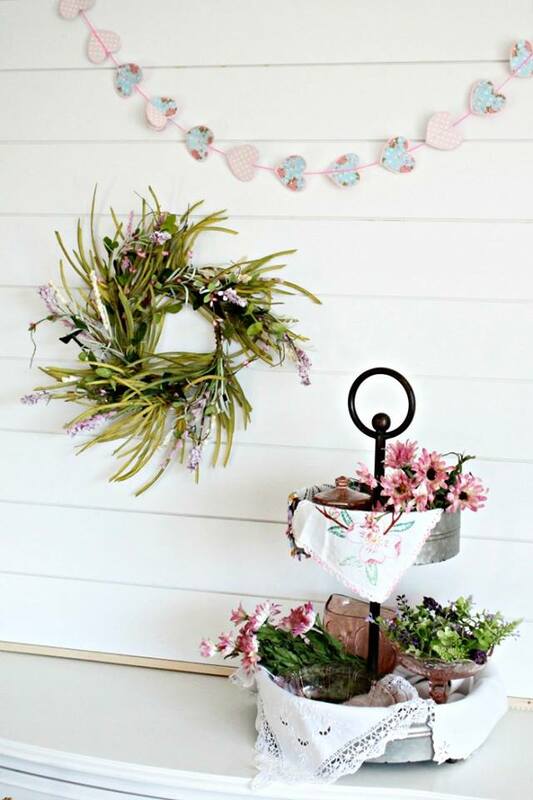 I tend to stick to traditional decor with little bits of other decor styles including farmhouse decor added. As a blogger and obvious decor fanatic, I am just a “tad” overzealous with using picture hooks everywhere. To be fair I do fill them regularly and do most of the interior painting but Hubs was getting annoyed at the various nail holes and different heights so my artwork backgrounds looked good. This shiplap wallart background is my solution and I am so happy with it. It doesn’t look like much on its own, but oh my it is so versatile for decor vignettes and I can move it from room to room wherever I want to. 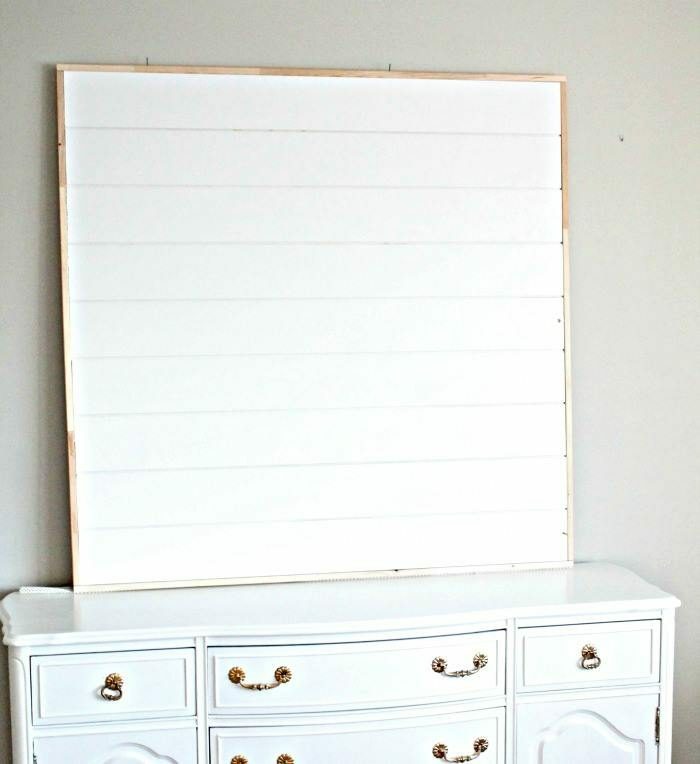 I am going to start by showing you how remarkably handy this diy shiplap wallart is, how I use it, and then how you can make one of your own. When you place something in front of it, it already looks more finished than a simple plain wall. Don’t you agree. Click here for her full step by step tutorial. Thanks Leanna! I think I may just be sold on painting out my shiplap, what do you guys think? 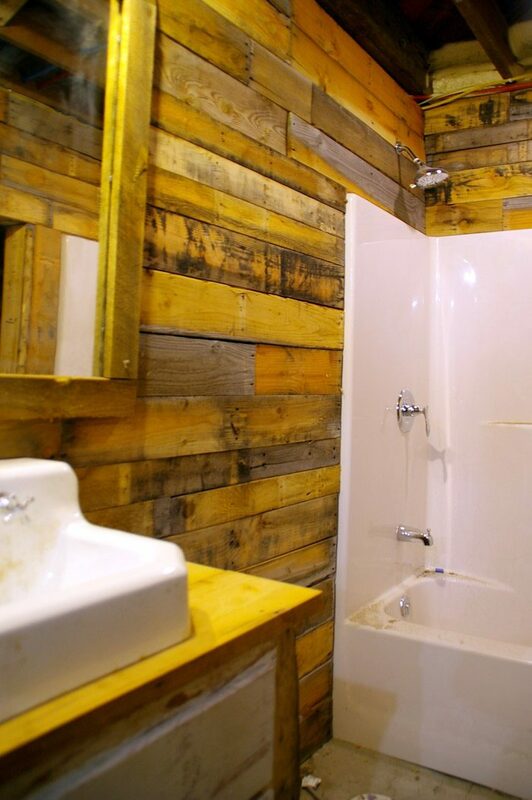 Should I keep the rugged barnwood look and just let my basement bath be, or would a white wash bring some light to an otherwise window-less space? I covered all of the walls in my basement with shiplap, barnwood and pallet wood that I had leftover using a brad nailer and 1 1/2″ brads. The result was a dramatic space that I just can’t wait to finish! Thanks Leanna for showing us how we can get the ship lap look without the permanence of a full wall application! This is beautiful! nice and creative use of shiplap to give the house that brand new makeover with out changing much and spending much. Thank you Susan, that’s what I was thinking too! That way its not solid white but still looks like wood! Not sure if you have decided to paint them yet…but I love them as they are…. I would add colour with fabric touches like carpets and towels and leave the wood. Let me know if you do decide to change it up. Hi Leanna, yup I will definitely let you know. I plan on leaving the ceilings totally open and spraying them black, once I get that done I think I’ll know whether or not I’ll paint the bathroom walls. Right now it feels REALLY woody and REALLY industrial, but I think once I tone those ceilings down the walls will look a lot better as they are. I could see doing a whitewash in the basement to lighten it up. Basements tend to be dark, but hey, it was free wood! Hi Nancy, exactly, free is my favorite! Once I get those ceilings painted I think I’ll know for sure if I want to tone it down or not! Thanks! A white wash might be a solution. 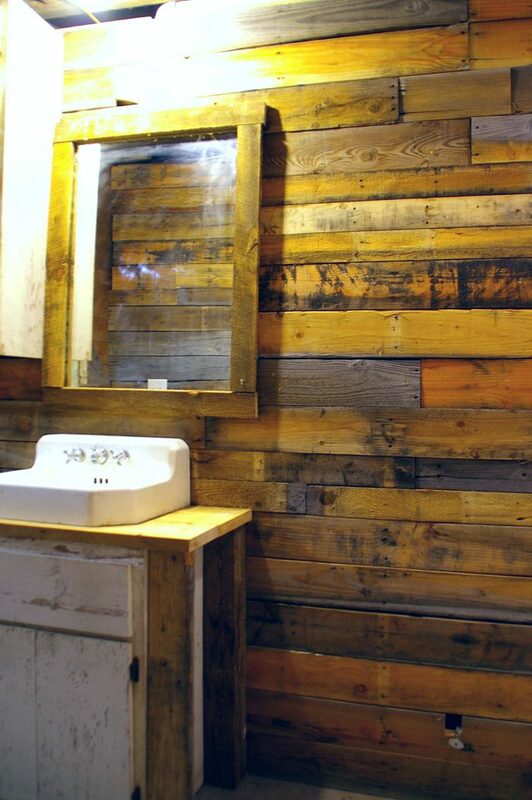 It would lighten the room but keep the more rustic feel. Just an idea. Enjoy your blog. Thanks Frances, I’m definitely thinking about! Have a great week! I love the rustic look.I would leave the walls as is and paint everything else. And then someday, when I was really tired of the look, paint the walls. I love seeing the juxtaposition of yours and Leanna’s! Thanks Nikki, have a great weekend! !